Know what I love about this recipe? That it’s easy to make and no one will ever suspect you cleaned out your freezer to make it. Every six months or so, when my freezer is over-run with leftover hot dog and hamburger buns and half of several baguettes, I make bread pudding. The finished product is so pretty and so delicious, no one will ever suspect. Perhaps it’s the buttery bread pudding…perhaps it’s the whiskey sauce that goes on top…perhaps it’s the perfect combination of both, but it’s fabulous and now it’s available all of you. This recipe makes one 9”x13” pan, or 12 very generous servings. 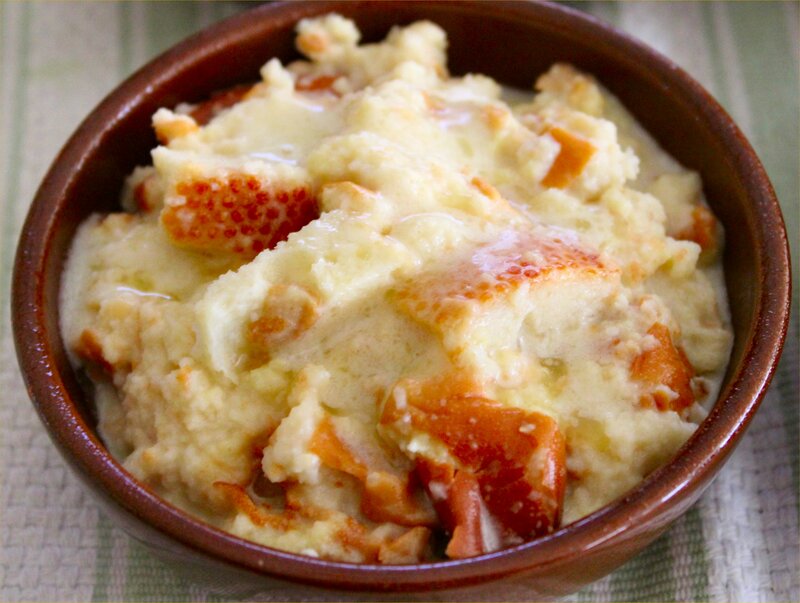 Bread pudding couldn't be easier to make, really! Pre-heat your oven to 350F and make sure the oven rack is in the middle position. Clean out your freezer and let your bread thaw. I like to use a mix of 70% buns and 30% French bread for this recipe. It’s about texture. The buns will get soft and a little mushy, and the French bread will hold its shape. Together, they make a perfect finished texture. Begin by cutting the thawed bread into ½” to ¾” cubes. I know 20 cups sounds like a lot of cubed bread, but it smushes down once the liquid is added. Throw the bread into a large mixing bowl and set it aside. In a separate bowl, combine the cream, milk, eggs, sugar, vanilla extract and vanilla syrup (optional). Beat until well combined and pour over the bread cubes. Let sit for one minute, and then toss with a spatula to coat the bread with the milk mixture. Wait another minute and toss again. Do this several times, or until the milk mixture coats all the bread cubes and has been absorbed, for the most part. Spray a 13” x 9” baking dish or pan with cooking spray; pour in bread mixture and using a spoon or spatula, push the mixture out into all four corners to create an even thickness. Do not smooth out the top like you would a cake batter. You want the top surface to be lumpy and bumpy to catch all that beautiful melted butter. Trust me. Next, melt the unsalted butter and pour it evenly over the top. Place your baking dish on a rimmed cookie sheet (to prevent spill-over in your oven) and bake at 350F for 40-60 minutes, or until the top is a gorgeous golden brown and the center is not longer jiggly. Remove from the oven and allow it to cool. In a heavy-bottom sauce pan, beat the sugar and butter with a whisk until well combined. Turn the heat on to medium-low and while whisking constantly, cook until it is bubbly and the sugar starts to dissolve. This will take 6-8 minutes or so. Don’t walk away from the stove…this can scorch or burn quickly. Once the mixture is bubbling and foamy, stir in the booze and continue to whisk until sugar is completely dissolved and it returns to a bubbling boil. In a separate mixing bowl (metal or glass), crack your eggs and beat until lemon yellow. Using a ladle, gradually add some of the sugar/whiskey mixture into the eggs, beating furiously with your whisk. It’s really important that you beat the eggs rapidly with your whisk while you slowly add the whiskey mixture. Failure to do so will result in curdled eggs. (If that happens, don’t panic. You can strain the sauce before you serve it.) Once you’ve added enough whiskey mixture to warm the eggs (about ½ a cup), begin to slowly whisk the egg mixture back into the pan of whiskey/sugar. Again, beat furiously to incorporate the two to insure that the eggs don’t curdle. Remove the sauce from the heat, and continue to beat for another minute by hand, until everything is incorporated and the sauce is smooth. Serve warm over bread pudding. Resist the urge to eat it straight from the pan with a big spoon, especially when it’s flaming hot. The sauce should be stored in the refrigerator; just warm it in the microwave before drinking serving. 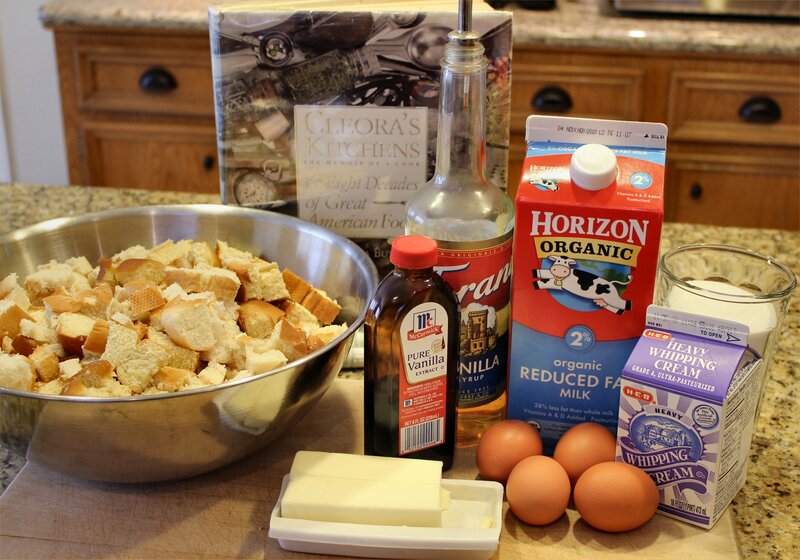 Bread pudding - even before baking, it looks delicious! And that’s my recipe for bread pudding with whiskey sauce. It was adapted from one of my favorite cook books, Cleora’s Kitchen by Cleora Butler. Whether you eat it warm, room temperature or cold, it’s always delicious and it would make a great addition to your holiday menu. 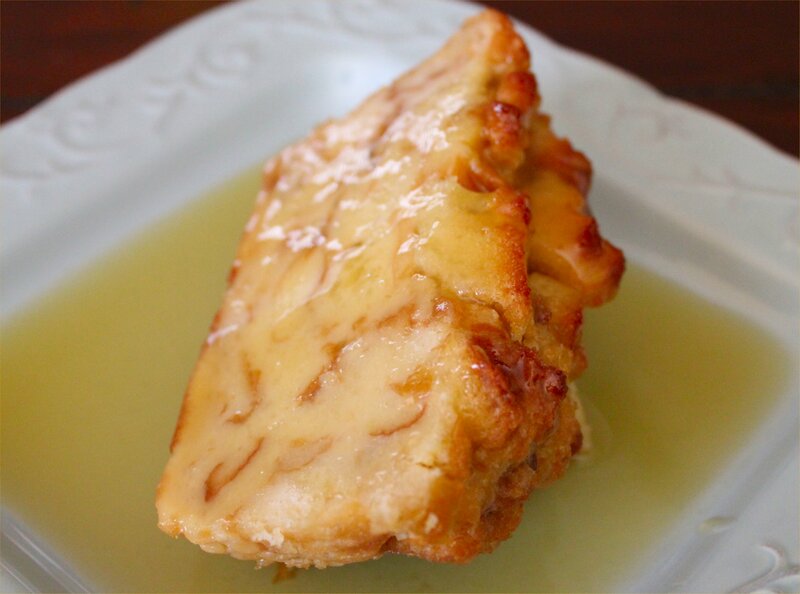 If you love bread pudding, I hope you’ll try it and let me know what you think. Happy holidays, and happy eating! Wow, I didn’t know you could actually make something out of hamburger/hot dog buns. I’m always throwing them away from the freezer. I’ve only had bread pudding once and it was good, but I wasn’t a fan of the mushiness. I like your tip about the french bread. I’m going to try this next time i clean out the freezer! Use all French bread, and try putting it in a flat pan (like a 13×9) to soak. Don’t toss it around as much, just make sure the bread gets soaked. That will give you a firmer texture. Let me know if you try it! PS – You don’t have to throw out those leftover buns from the freezer. They make great homemade croutons. Just cube them up and toast them in a skillet with melted butter and add your favorite seasoning mix. They’re great on a salad! No way – hot dog buns??? I can not even begin to tell you how many buns we end up throwing away…I am so going to start freezing them to try this recipe! Yum yum yum. It’s true, my friend. The batch photographed contained 14 hot dog buns, 2 burger buns, and two small French baguettes. The key is to not over smush the bread with the milk mixture. Try folding gently to keep everything lightly mixed and still lumpy, otherwise you’ll have a solid block of baked bun mush. I also highly recommend making sure there is at least some French bread to keep the texture varied. All buns makes for a pretty dense bread pudding. Of course, it goes without saying that you probably shouldn’t include deli rye, pumpernickle, or “everything” bagels in this recipe, either. That would just be gross. Interesting, but gross! There is just something about ‘baked bun mush’ that is calling my name. I see a bread pudding in my immediate future! You’re asking the wrong woman! In my world, there is nothing wrong about butter, bread and whiskey – whether it’s combined or not! As a great dog-sledder once said, ‘MUSH!’ Sorry, couldn’t resist.